Now that I’m up to my 41st cook book, it’s getting harder to remember what I have and haven’t cooked from. I’m really going to need to get some check list going on before I accidentally repeat one. This battered and bruised one was definitely one I hadn’t cooked from before. It’s a more recent addition to the collection. My dad has suddenly decided that every time he sees a Woman’s Day/Woman’s Weekly book in the op shop he’s going to get it for me, regardless of quality. There’s no date on this book, but the fact it boasts being printed in colour on the cover gives you some notion of how old it is. Unsurprisingly it’s filled with all the classics. Many of which I’d tried, or tried some variation of, when I first started learning how to bake. It was difficult to find something I hadn’t baked before, until I came across the Yeasted Breads chapter. Being rather new to bread making, there’s quite a number of things I’m yet to try. Most of those on offer were basic breads, crumpets or muffins. But I eventually settled on the croissants. They’re something I absolutely love, have always intended to make at home, but just never got around to it. The cook book challenge is always the perfect opportunity to scratch another off of my list. Matching the books age are many of the ingredients in a lot of the recipes, not to mention the methods. My first obstacle was obtaining fresh yeast. It’s not something that’s readily available in supermarkets here any more and usually requires a special trip to obtain. After confirming that all my local supermarkets were clear of it, I opted to substitute dried yeast instead. 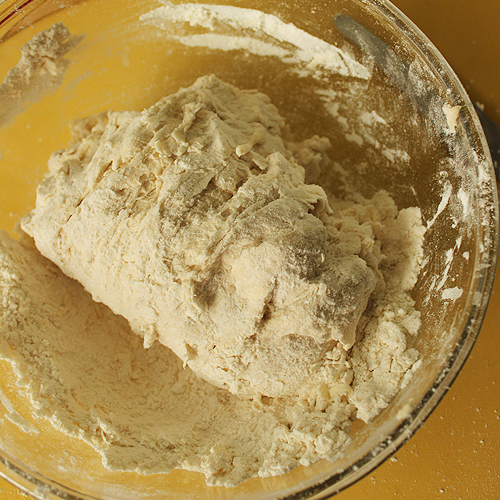 10g of dried yeast is enough for this recipe if you have to sub it, too (the substitution ratio is usually about 3:1). The first step is always proofing the yeast. Your water needs to be around the 30°C mark. You can get accurate if you need, but I always do the wrist test: if the proofing liquid burns to touch then it will kill your yeast. Make it a comfortable temp for you and your yeast will be happy. Cover the yeast and let it do it’s thing for 5-10 minutes – if it gets foamy (and you can smell the yeast) then you’re all good to go. Add it, and the egg to your flour mixture and get ready for some steady arm work. There’s no indication in the recipe about how long to knead the dough for or what signs to look for. I went for the typical: kept going until it was smooth and elastic. 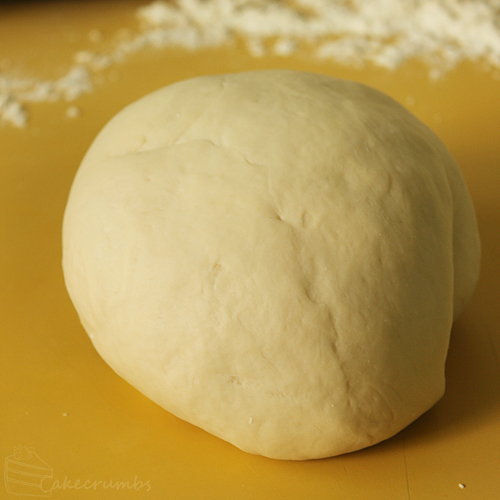 The dough starts out really firm, so it took a good 10 minutes of kneading to get it feeling right. This procedure is a lot quicker than most other croissant recipes I’ve seen. It requires much lest resting and the laminating technique is more akin to a rough puff or flaky pastry. You roll your dough out into a long rectangle and dot it with butter (I was pretty lazy and didn’t cut the butter up into small squares, but if you change direction when rolling it out it doesn’t matter). 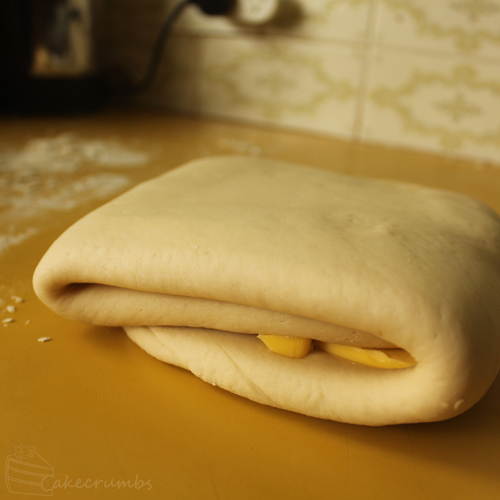 Fold the butter up into a little blanket and roll out to repeat the process. 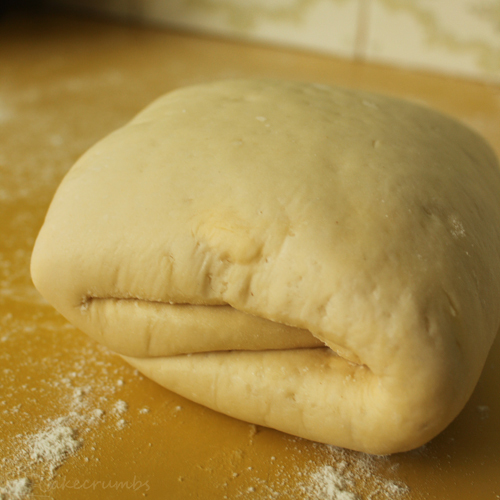 Then your dough gets to have a nap in the fridge. If the dough has risen upon retrieval, you know your yeast is definitely alive and kicking. 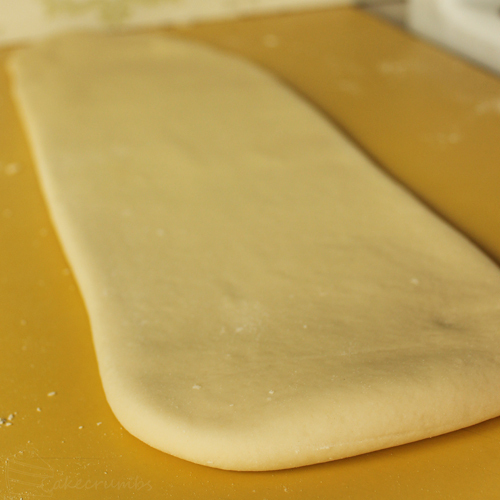 Roll out your dough one final time into an even larger rectangle, then you can begin rolling your croissants. Now… here’s where the recipe lost me a little bit. 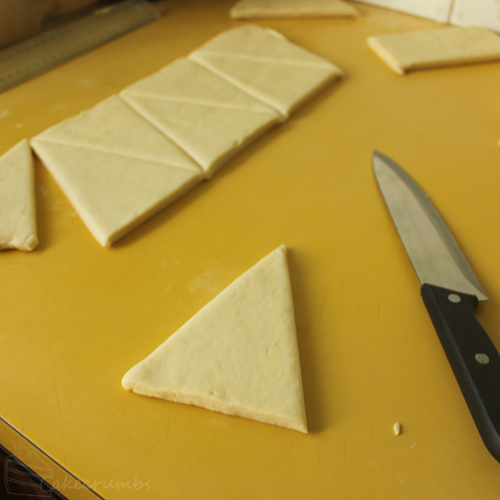 It asks you to divide the dough in two, cut each into 3 squares and then cut those squares into triangles. I feel like I’m missing something really obvious here, but as far as I can see doing that gives you right-angled triangles. 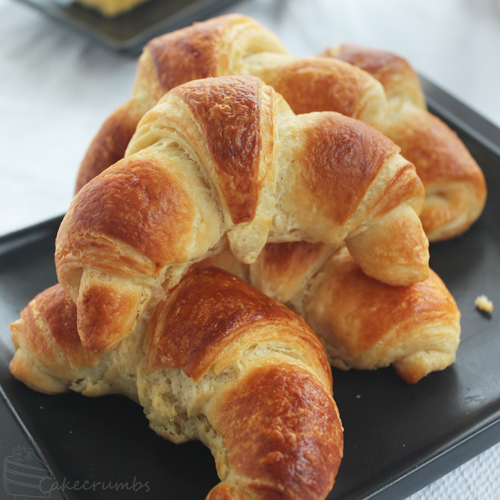 To get the typical croissant shape you need equilateral triangles. So here’s where I ignored the recipe and did my own thing. The dough isn’t sticky, so you can cut one triangle and use it as a template for the rest. Give them plenty of space on the baking trays as these guys really puff up. 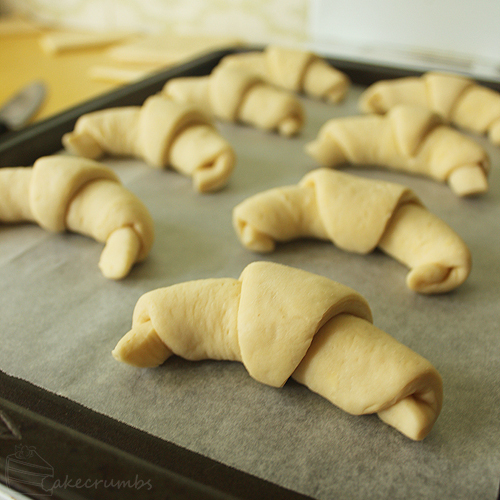 After one more nap and a quick stint in the oven, you’ll have a batch of crispy, flaky, freshly baked croissants. This recipe makes at least a dozen, pending on how large you cut your triangles. You can fill them with anything you like, sweet or savoury, as these guys are an open canvas waiting to be splashed with a few of your favourite things. We just like ours with a little butter. The recipe only gives cup measurements for the flour. I’m assuming they’re referring to Aus cup measurements (there’s no indication) so I measured out 600g flour. But only ever work in as much flour as the dough will hold. Everything, from the size of the egg to the weather on the day will determine how much flour the dough will take so always go by feel above exact measurements. 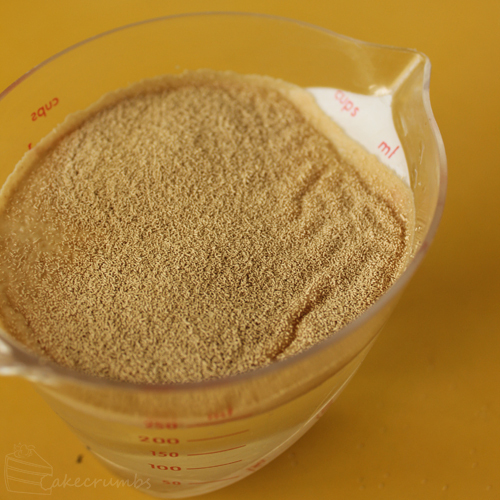 Blend the fresh yeast with the water. sift together the flour and salt; rub in the lard. 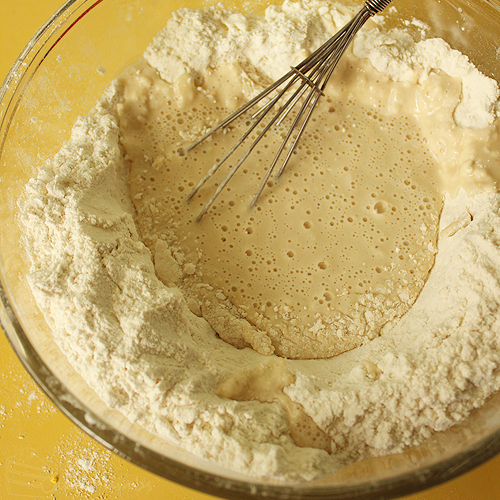 Add the egg and the yeast liquid and mix to a dough. Knead well. 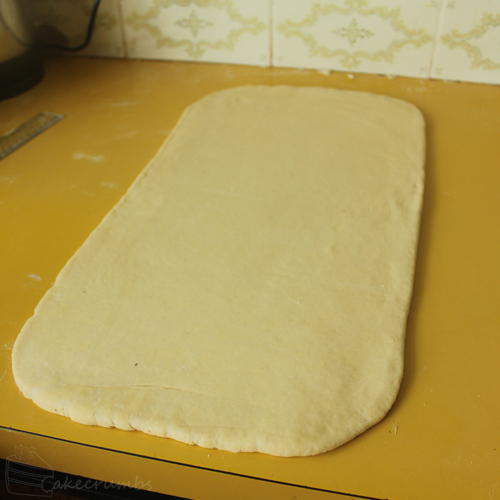 Roll out the dough to a rectangle 50x15cm (20 x 6in). Divide the butter into three. 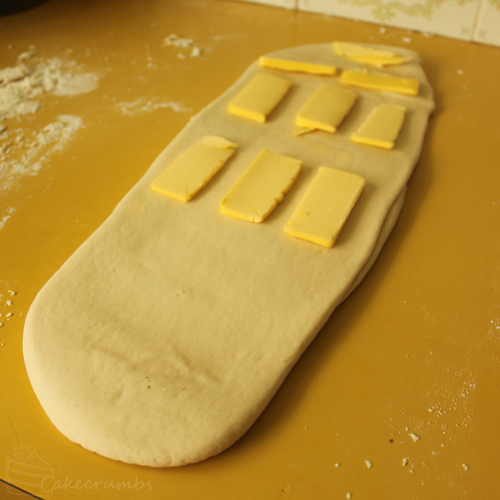 Dot the top two thirds of the dough with one part of the butter, fold the dough in three and roll. Repeat using other two parts of butter. Rest between rollings. Repeat the folding and rolling three more times. Put in a polythene bag and leave in a cold place or refrigerator for at least 1 hour. To shape the croissants, roll the dough out into a rectangle slightly larger than 45 x 30cm (18 x 12in), cover with oiled polythene bag or damp cloth and leave for 10 minutes. Trim the edges. Divide dough in half lengthways; cut into triangles. Beat the egg with water and sugar; brush over triangles. Roll up each triangle loosely towards the point, finishing with the tip underneath. Curve into a crescent. Place on baking trays. Brush with egg wash, place oiled polythene bags on damp cloth over the top and leave to rise in a warm place for 30 minutes. Brush again with egg wash; bake for 15-20 minutes, or until golden brown. 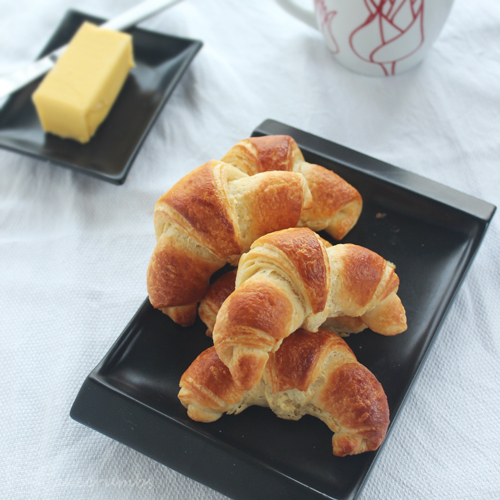 These look great.I have always wanted to try croissants, too. You have inspired me. I did make palmiers a number of years ago – so much work – soooo delicious! The difference between countries is truly surprising sometimes! I read so many recipes using corn syrup, but tracking it down is near impossible. Then others will comment asking me for a substitute for something impossible to get in their country which is quite easy to find here. 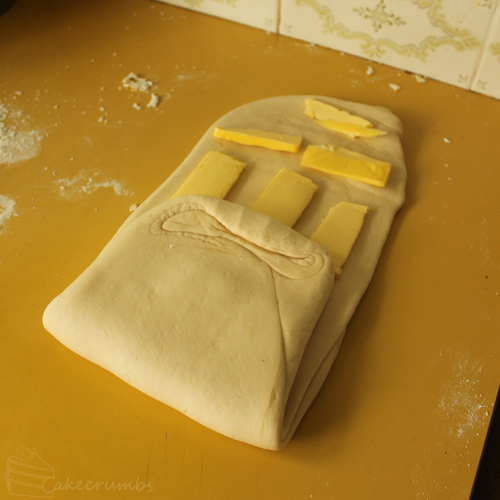 I am new to your blog and thus far am very impressed with you and your baking talents. Like you, I taught myself and have enjoyed every failure and success since I began about 15 years ago (I am now 44 – a late bloomer!). 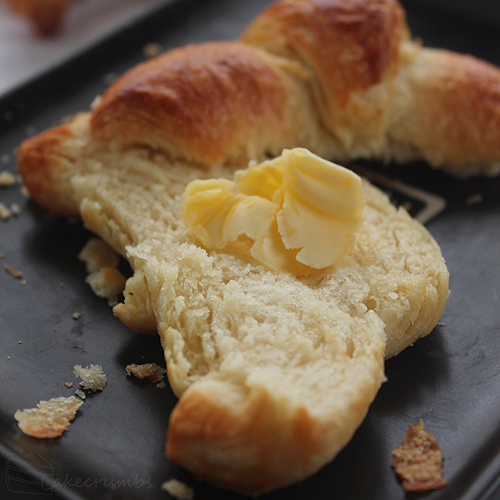 My first attempt at real baking was croissants – and they turned out as lovely as yours appear to be. Next batch had a thin smear of chocolate within… another success. Keep up the beautiful work; and for God’s sake, keep teaching as many people as you can the joy of baking! P.S. The Jupiter cake is spectacular! Thank you for your endlessly lovely comment! It’s always wonderful to hear from other people who are self-taught — it’s certainly a rocky road to success, but it’s a wonderful one!